Barry M recently added a new line of nail paints to their extensive range, in the form of the Molten Metals collection. There are currently a choice of 4 shades available in the Molten Metals range - 'Gold Digger','Copper Mine','Silver Lining' and the shade which I have 'Bronze Bae'. You can view the full shade range and purchase for yourself here. 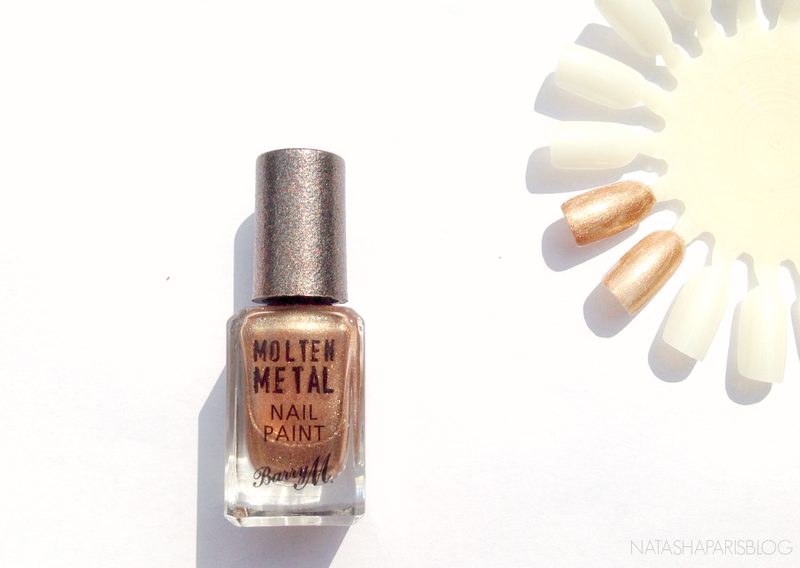 This has been my nail colour of choice recently, I love the shimmery metallic effect and I think this is one of those shades which would work well with any colour of clothing - from brights to neutrals. I like to apply two coats of colour to my nails, however this shade also works well with just one coat applied - as you can see from my swatches there is very little difference between them. When I've worn this colour on my finger nails I've found it to last around 3-5 days before chipping (depending on what I've been doing), and of course much longer on toes. When it comes to removal this nail polish can be pretty tricky to remove, due to the fine glitter particles within the product. I'd recommend applying a base coat underneath this colour which should help to prevent the glitter from sticking around where it's not wanted and therefore making removal easier. The tricky removal of this shade is the only negative I've found. Have you tried any of the new Barry M releases? I'd love to know your thoughts.